PT Railink - Railink is a rapid growing transportation services company in Indonesia with business specializes in airport railway services (ARS). Railink operates primarily as a special transportation airport railway operator in Indonesia. Railink was designed to provide comfort and convenience for airline passengers. PT Railink is a joint operation company between 2 state-owned companies; state-owned railway operator PT Kereta Api Indonesia (Persero) or KAI Group and state-owned airport operator PT Angkasa Pura II (Persero) or AP II Group, respectively with share ownership of 60% and 40%. Railink's first services commenced at Kuala Namu International Airport North Sumatera. Railink is based in Jakarta and now has 1 branch office at Medan North Sumatera. In term of financial performance, Railink managed to recorded good performance in the business year of 2017. According to information found in PT Kereta Api Indonesia (Persero) Annual Report 2017 as cited by JobsCDC.com, Railink managed to record total revenues of Rp84.9 billion in 2017. This total revenues reflected an 10.9% increase from Rp76.59 billion in 2016. Railink recorded a net income of Rp1.89 billion, increased by 107.0% compared to a net loss of Rp27.57 billion in 2016. Not older than 26 years of age. Minimum Diploma/Bachelor Degree (D3/S1) majoring in Informatics Engineering / Information Systems / Computer Science. Minimum 1 year of experience in the related field. Fresh graduate are welcome to apply. Hard worker, thorough and careful. Able to work with monotonous task. Mastering Basic Query Database SQL and Basic Programming. Mastering MySQL and PostgreSQL DBMS with various Complex Queries. Familiar with Git Versioning Control. Mastering Android Programming, Xcode and React Native is added value. Able to work under pressure with a fast target time. Have analysis and logic that is fast, precise and accurate. Mastering the UML concept is an added value. JobsCDC.com now available on android device. Download now on Google Play here. Please be aware of recruitment fraud. The entire stage of this selection process is free of charge. 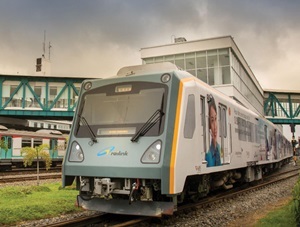 PT Railink - IT Specialist, Staff Admin Technical Document Writter Railink KAI Group April 2019 will never ask for fees or upfront payments for any purposes during the recruitment process such as transportation and accommodation.